← Too Much to Do? My Aunt died this week. She was 91 years old and suffering with congestive heart failure. It is not hard to engage the rational mind and say that this is a blessing, an evidence of the grace of God. Her death marks the last person in the generation ahead of me. I now have no parents, aunts or uncles. As one would expect, I am flooded with memories of my childhood, when this Aunt loved me as one of her own. Most of the memories are probably too personally specific to be fun for anyone who wasn’t there at the time. But, what this Aunt’s death screams for me is that I have lost my direct connection to my Norwegian heritage. I don’t know anyone, but me, in our family that understands the spoken Norwegian language. I don’t know anyone for whom the financially worthless items passed down through the generations will be embraced as treasures. I don’t know anyone who will agree with me that Christmas without lutefisk is a sad thing. 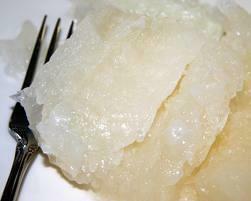 Thankfully, lutefisk is in the Bible: The piece of Cod that surpasses understanding! This entry was posted in Stories and tagged Aunt, Bible, Christmas, Cod, family, heritage, lutefisk, Norwegian, parents, Uncle. Bookmark the permalink. Resonate with loss re those financially worthless items that you embrace as treasures and grieve the future loss. I am like that with my recipes! I have favorite family traditional recipes that no one other than myself will make. Wish I had someone who would carry these on because that person loves the recipe. Every Christmas I bake oatmeal, raisin, chocolate chip cookies whose only Christmasy characteristic is the cinnamon smell. I know my younger brother loves them & wants them – they evoke memories, plus taste great (are my favorite cookie). Yet no one else appreciates them enough to even want the recipe. Small loss, but makes me feel nostalgic with a little bit of sadness. Never give up hope that there will be someone in the younger generations interested in those priceless treasures – or learning about their Norwegian Heritage. Your blog post was shared with me by a friend who knows that “min mor og jeg” are in the process of reclaiming our own norwegian heritage. Min mor er 78 år gammel. Hun og jeg og sostre min laere norsk nå. Min morfar kam fra Norge i 1920/’s men ikke snakket(?) norske med barne ham. My grammar may not be correct – but hopefully you understand. There are several Norwegian organizations as well where you can share your love of all things norwegian – and you may even find one or two who long for the days of Lutefisk på Jul.